“The United States government, including Homeland Security Investigations and the Washington, D.C. FInancial Crimes Task Force, is currently conducting a criminal investigation. As part of that investigation, the United States Attorney’s Office for the District of Columbia has requested a United States District Judge to pause currnet civil litigation relating to Payza and Obopay. The Judge has paused the litigation until January 22, 2016. Shortly after that date, additional information will be made available on this website about the status of this investigation. or call 202-252-1903. Please include your name, email address, and contact information in your message. Someone will respond to your email or call within 3 business days. Ripple Labs Inc. and its wholly-owned subsidiary, XRP II LLC, formerly XRP Fund II LLC, have agreed to resolve a criminal investigation in exchange for a settlement agreement calling for a series of substantial remedial measures, including a migration of a portion of Ripple’s virtual currency business to a separate entity, the company’s ongoing cooperation in other investigations, an extensive remedial framework to ensure future compliance with federal laws and forfeiture and penalties totaling $700,000, announced U.S. Attorney Melinda Haag of the Northern District of California, Director Jennifer Shasky Calvery of the U.S. Treasury Department Financial Crimes Enforcement Network (FinCEN) and Chief Richard Weber of the Internal Revenue Service (IRS) Criminal Investigation Division. The agreement will resolve allegations that Ripple and its subsidiary failed to follow the law while engaging in the exchange of virtual currency and that the entities failed to establish and maintain an appropriate anti-money laundering program. Ripple Labs Inc. is headquartered in San Francisco, California, and developed and sold virtual currency known as “XRP.” As of 2015, the currency of the Ripple network, XRP, is the second-largest digital currency by market capitalization. The agreement formalizes the steps Ripple and its subsidiary must take to bring its virtual currency operation within the existing regulatory framework for money services businesses. The agreement consists of a settlement agreement, an agreed statement of facts, and a remedial framework for the company going forward. Aside from monetary penalties in the form of forfeiture, the remedial framework requires the migration of any component of Ripple’s business that is engaged in the exchange of virtual currency into an entity registered with FinCEN. In addition, the agreement calls for continued enhancements to the company’s anti-money laundering (AML) controls and training program. Further, the remedial framework calls for external audits through the year 2020, enhancements to the ripple protocol, increased transaction monitoring and an extensive review of historical activity. The agreement is the culmination of a criminal investigation conducted by U.S. Attorney’s Office and the Internal Revenue Service’s Criminal Investigation Division. FinCEN joined the investigation with a parallel civil enforcement action. In that action, Ripple Labs and XRP II have agreed to pay a $700,000 civil penalty, $450,000 of which will be designated a forfeiture to settle issues raised in the U.S. Attorney’s investigation. Ripple described itself as an exchanger of virtual currency in a December 2013 filing made in San Francisco, California, federal court in an unrelated case. As an exchanger, Ripple was required to register with FinCEN and to comply with applicable federal laws and regulations. Yet Ripple sold XRP even though it had not registered with FinCEN, effectuating sales of over approximately $1.3 million in April 2013 alone. Ripple also failed to establish and maintain an appropriate AML program and failed to have policies, procedures and internal controls to ensure compliance with the Bank Secrecy Act and anti-money laundering laws. In July 2013, Ripple incorporated a subsidiary, now known as XRP II, that replaced Ripple as the seller of XRP. Although XRP II registered with FinCEN, it failed to have an effective AML program or to file appropriate suspicious activity reports. In late 2013, for example, it negotiated a $250,000 transaction with an individual who had prior felony convictions for dealing in explosive devices and had been sentenced to prison, failing to follow its own internal “know your customer” requirements. Assistant U.S. Attorneys Kathryn R. Haun and Arvon J. Perteet handled the matter on behalf of the U.S. Attorney’s Office with the assistance of Daniel Charlier-Smith and Leslie Cook. The settlement agreement with Ripple Labs was the result of a coordinated effort by the U.S. Attorney’s Office and IRS Criminal Investigation, working in tandem with FinCEN. Achieve Community: Kristine Johnson, Can You Say Criminal Investigation?? Defendant Kristine Johnson has filed two interesting Motions yesterday, one a Joint Motion requesting the authority to transfer funds, and the second a Joint Motion to Seal further filings so that Defendants Troy Barnes and Work With Troy Barnes, Inc. do not have access to them. It seems there may be trouble in paradise. 2. Contemporaneously with the civil proceedings in this case, Ms. Johnson is a target of a federal criminal investigation by the United States Attorney’s Office for the Western District of North Carolina. This Motion goes on to say that these “criminal authorities” had approached Ms. Johnson’s attorneys regarding the voluntary transfer of over $800,000 associated to both the ongoing criminal and civil investigations. Because these funds “derive directly or indirectly from any investor”, and are located in Hong Kong. Due to the Preliminary Injunction, Ms. Johnson cannot execute a voluntary transfer without violating the Preliminary Injunction. to permit the funds transfer from the “ipayDNA.info” account, to which she has access, to a pre-arranged bank account located in the United States, such that authorities will be able to freeze and potentially seize the funds as part of their on-going criminal investigation. Ms. Johnson shall not execute the transfer of funds from the ipayDNA account until such account has been established, and she has received the express written permission of undersigned counsel for the Securities and Exchange Commission to transfer the funds. Because of the nature of the proceedings referenced in the parties Joint Motion for Authority, the parties’ interests, as well as that of other entities not party to the motion, at this time substantially outweighs the public’s interest in open proceedings. If not sealed, it is possible that the relief sought by the parties’ Joint Motion could be stymied by adverse interests. Defendant Kristine Johnson and the SEC respectfully request that the Joint Motion and any subsequent order be restricted only to the filing parties – Defendant Johnson and the SEC – and the Court. Specifically, the parties request that Defendants Troy Barnes and Work With Troy Barnes, Inc., not have access. These two filings are on the Files Website, Doc 28 and 29. First, the timing of the relevant events shows a temporary restraining order is not warranted. Preferred initiated the transfers at issue before the Court entered its freeze order. Thus, contrary to the Receiver’s assertions, Preferred had no legal obligation to freeze any assets prior to the entry of that order. Second, the purpose of a temporary restraining order is to maintain the status quo pending a preliminary injunction. Here, the TRO effectively obliterates the status quo and drastically alters the relative positions of the parties. Third, the Receiver has not demonstrated a likelihood of success on the merits or a threat of irreparable harm, both necessary elements in order to obtain a temporary restraining order. Accordingly, the Court should grant Preferred’s Motion and dissolve the TRO. Additionally, the Court should grant Preferred’s pending motion to lift the stay and proceed with its declaratory judgment action against the Receiver. In light of the contentions raised in Preferred’s Motion, the Court STAYS its previous Temporary Restraining Order (Doc. No. 274) pending resolution of Preferred’s Motion to Dissolve. The Receiver is directed to file a response to the Motion to Dissolve as soon as practicable. The hearing set for November 12 will remain in place unless otherwise ordered. Of course, we will continue to follow this development as the outcome will be most interesting, especially how Preferred plans to disprove the SEC’s phone records. BehindMLM: Craddock Writes a Zeek Rewards Book???? A sick joke? Robert Craddock publishes Zeek Rewards book. Out of all the people on the planet who might pen a book about Zeek Rewards, arguable none would be less qualified to do so than Robert Craddock. Craddock, an investor in the Zeek Rewards, was hired by Gregory Caldwell to assist him with silencing Zeek Rewards’ critics compliance. After the SEC shut down Zeek Rewards and revealed it to be an $850 million Ponzi scheme, Craddock was one of the most outspoken critics of the regulatory agency. Craddock pushed all sorts of conspiracy theories in the immediate aftermath of Zeek through ZTeamBiz, a network of investors he set up. 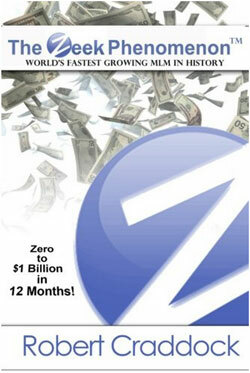 Wishing to pursue legal action against the SEC, Craddock convinced investors of Zeek to send him thousands of dollars. Through ZTeamBiz, Craddock promised to put the money towards defending investors against future regulatory action. The money ZTeamBiz fleeced from affiliates who donated was originally gathered to be used to defend all Zeek Rewards affiliates who donated against impending SEC litigation. Shortly after the bulk of the money that would be donated was donated however, this changed to the offering of a cookie-cutter attorney letter, provided at an additional cost. It is widely believed that the bulk of it went towards financing the legal defences of the Zeek Rewards net winners that formed ZTeamBiz. In the months following the SEC shutdown, a number of legal initiatives were launched by ZTeamBiz affiliates to try to thwart attempts to recover funds they stole from their fellow affiliates. To date, every single one of these actions has failed. After that farce, Craddock’s name continued to pop up in connection with a number of shady schemes. It wasn’t until late 2013 that regulators and/or the Zeek Receivership shut him down. After a series of Ponzi points business pushed by Craddock flopped, his newest role appears to be that of publisher. I am pleased to announce that today, September 30, 2014 approximately 90,297 checks are being issued and mailed to Affiliates that hold Allowed Claims as their first interim, partial distribution. These first interim, partial distributions total approximately $134.2 million (with approximately $23 million of the $134.2 million required by law to be withheld for tax purposes) of the assets collected by the Receivership Team. This first interim, partial distribution represents, with certain limited exceptions, an amount equal to 40% of the Allowed Claims of all Affiliates holding Allowed Claims as of August 15, 2014, using the “rising tide” method of calculation previously approved by the Court. Affiliates that are being mailed checks on account of the first interim, partial distribution have each filed a claim, had such claim determined by the Receivership Team, accepted that claim determination, and provided the required release and OFAC Certification to the Receivership team. These items are all required by the Court in order to have an Allowed Claim. If you met these criteria as of August 15, 2014, and your first interim, partial distribution is in excess of $100, you will receive a distribution check via mail. If, as of August 15, 2014, you had not received a claim determination, had not accepted a claim determination, or had not provided the required release and OFAC Certification to the Receivership team, you did not hold an Allowed Claim on August 15, 2014, and were not eligible to receive a first interim, partial distribution. Additionally, if you held an Allowed Claim, but you would have received a distribution of less than $100, no first interim, partial distribution will be paid to you. You will be paid on account of your Allowed Claim in the future. Additionally, approximately 70,000 Affiliates hold claims that will be allowed against the Receivership Estate if and when any of those Affiliates provide the required release and OFAC Certification to the Receivership team. All of these 70,000 Affiliates (or any additional Affiliates that receive and accept their claim determination prior to December 31, 2014) will be issued their first interim, partial distribution on January 30, 2015 if that Affiliate provides the required release and OFAC Certification to the Receivership Team by December 31, 2014. Affiliates whose claims become Allowed Claims after December 31, 2014 will receive their first interim, partial distribution on a subsequent distribution date. We have 7,000 more claims to review. If you have not received your claim determination, please be patient; it is coming shortly. If you have already received a claim determination, or when you do, I encourage you to respond as soon as you are able and provide all the required information so that we can mail you your first interim, partial distribution on the next distribution date on which you are eligible. If you have questions regarding whether your claim determination has been issued, the general status of your claim or to provide the required release and OFAC certification, please log into the following website: https://cert.gardencitygroup.com/zrwdet/fs/home. Our efforts on your behalf continue. Thank you for your continued support and patience. it is critical that, in whatever process the Court determines would be best for resolving these issues, if the Court does not order the immediate repayment of the $4.8 million, the Court should exercise its rights in equity and under the Agreed Order to require that the $4.8 million immediately be deposited with the Receiver, who can, if necessary, maintain the funds in a segregated account pending a final resolution. If Preferred Merchants and Jaymes Meyer are allowed to continue to retain these funds, there is a risk that the money will be dissipated or otherwise unavailable in the future, further limiting the Receiver’s ability to compensate the victims of the scheme. Specifically, the Court must determine whether the $4.8 million constitute Receivership and/or Recoverable Assets that should have been remitted to the Receiver’s custody and control as Receivership Property instead of being applied as a prohibited set off. Whether or not the transfer came before or after the Agreed Order, if it is a fraudulent transfer, then the funds are Recoverable Assets frozen by the Agreed Order that must be returned to the Receiver. In sum, Preferred Merchants and Jaymes Meyer violated the Agreed Order by failing to freeze and remit the $4.8 million in Receivership Assets and/or Recoverable Assets and Receivership Property, regardless of the claimed improper “set off” against its purported claims. For the reasons discussed above, the Receiver respectfully requests that the Court continue the litigation stay, grant the Receiver’s Contempt Motion, find Preferred Merchants and Jaymes Meyer in contempt for violating the Court’s Agreed Order, order them to remit $4,854,010.40 to the Receivership Estate or, at a minimum, deposit the funds with the Receiver to be held in a segregated account pending a final resolution, award the Receivership the cost and fees incurred in connection with this Motion and the Receiver’s Opposition to Preferred Merchants’ Motion to Lift the Stay, and such other relief that the Court deems proper. Defendants Trudy Gilmond, Trudy Gilmond, LLC, Jerry Napier, and Darren Miller ask the Court for an order staying discovery until fifteen (15) days following resolution of Defendants’ Motion to Dismiss. Because a favorable resolution of Defendants’ Motion to Dismiss would eliminate the need for discovery, good cause exists to stay discovery pending resolution of Defendants’ Motion to Dismiss. Without jurisdiction, there is no case: The Receiver’s claimed authority to file the instant lawsuit is derived from the Court’s jurisdiction in the SEC Matter; if the Court lacks subject matter jurisdiction in that matter, the appointment of the Receiver was improper and this lawsuit must be dismissed. The Defendants should not have to pay for the fees associated with the legal work necessary to respond to the Receiver’s discovery requests while a dispositive motion is pending before the Court. If the Motion to Dismiss is denied, the Defendants deserve a ruling as to whether the Receiver will pay some or all of their legal fees, as requested in Defendants’ Opposition to Receiver’s Motion for Class Certification, before they expend the costs and effort associated with responding to discovery. To allow discovery to go forward will result in unnecessary expense and effort pending resolution of the Defendants’ Motion to Dismiss. The Defendants are sufficiently impoverished that they should not be compelled to incur the substantial expense of responding to expansive discovery requests before a ruling on the pending Motion to Dismiss, as this motion may either obviate any need to respond to discovery. Some of these Defendants took out over $1 Million from Zeek and now the claim poverty? Right, let’s see how this flies with the Court. I will keep you advised on how the Judge responds to this one. Plaintiff, now standing in the shoes of RVG and seeking to assert whatever civil actions RVG might have, asserts a legal malpractice case against Kaplan for failing to stop the very enterprise that RVG’s insiders themselves created, implemented, and ran (Compl., ¶¶ 2, 49-67). I have uploaded the full document onto the Files website, Doc 12.